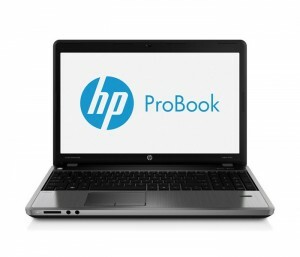 s soon as we laid our eyes on the HP 4740s probook we knew that we were facing a massive and stable product. The corpus is made from two different kinds of plastic, the lines are smooth and the corners are rounded. The surface is difficult to stain and does not attract a lot of dust. The angled periphery line adds a little rough charm to its appearance. The weight of the probook is exactly 2 kg 923 grams and its dimensions are 413 mm width, 279 mm in depth and a thickness of 29 mm. The lid is only a few mm, it’s bending resistant and its opening angle is wide enough. The diagonal of LED-backlit display of the HP ProBook 4740s is 17.3″ with HD and 1600 x 900 pixels resolution. The screen is anti-glare, witch as our test showed really cuts down the amount of light that reflects off the display even in direct sunlight. The upper lid is attached through tight and sturdy hinges that even after a little rough testing we didn’t report any loosening, grinding or semi-closing. The HD webcam with 2 MP is located centrally on the top of the display — it has auto focus as and white balance. Going trough the SRS Premium sound, we get to the keyboard. It has island style located buttons, which is great because the hands don’t get tired as quickly. On the other hand we made just a couple of mechanical mistakes while fast typing text on it. Also the shape of the buttons is ergonomic. With blue coloring we got the function buttons. Except for all the standard commands, you could use them to control the audio and video players. The touchpad itself is wide with a scroll zone and a multifinger multitouch. It’s two buttons are quiet with enough distance from one another. As expected the periphery of the HP ProBook 4740s is as rich as its size and functionality. It has 4 USB ports, two of which with the fastest version 3.0, HDMI port, a standard RJ-45 charging port and a 3.5 mm audio jack. Wireless connection with other devices is through Bluetooth 4.0 and the memory card reader is 4 in 1. When it comes to hardware — the high class probook should be proud of its Intel Core i7-3612QM — one of the best processors till date. With 6 MB L3 cache, the cores run at 2.1 GHz, but at an extreme Turbo Boost loading they could reach 3.10 GHz. Ram memory — 8 GB DDR3 at 1333 MHz and the hard disc has 750GB. The video card is AMD Radeon HD 7650M.The battery used is a 8-cell Li-Ion and with its powering the device could be used for up to 10 hours of moderate use.